SRINAGAR: A pall of gloom descended on Pulwama and Shopian belt of south Kashmir on Wednesday when six militants killed in two separate encounters on January 21 and 22 were lowered in their graves. The gunfights between the militants and the counter-insurgent forces took place back to back in Chrar-e-Sharief and Shopian. Mourners during the funeral procession of slain militant Shoiab at Sherimal village of Shopian on Wednesday, January 23, 2019. 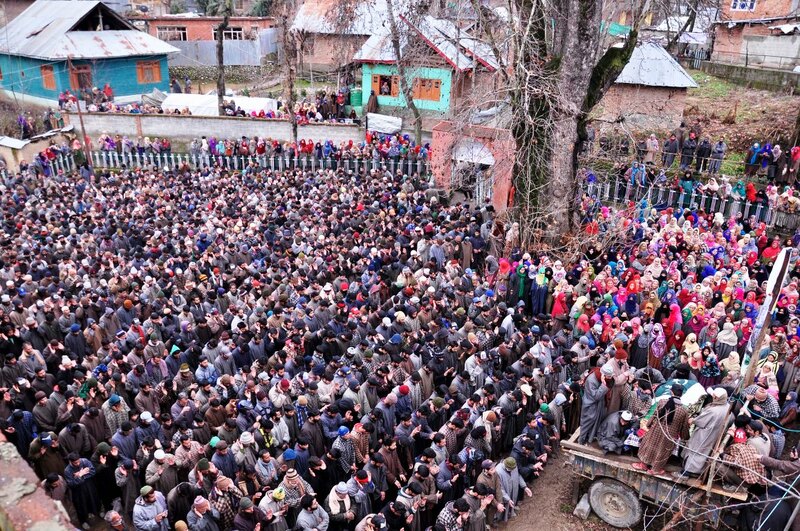 As per the reports, amid sobs and shutdown, multiple funeral prayers were held for the slain militants in their respective villages before they were laid to rest. Eyewitnesses confirmed to Kashmir Life that braving chill and restrictions, large gatherings were witnessed in all the funerals. The forces, as per locals, had sealed routes leading to the native villages of these slain militants, besides snap in the internet connectivity. However, a significant number of people while taking alternate routes managed to reach. Eyewitnesses said that all the shops and other business establishments were closed in both the districts and traffic was off the roads. According to the local reports, a couple of militants turned up at the funeral of Syed Ruban at Nazneenpora in Shopian and offered a gun-salute. Amid restrictions, the significant number of people managed their entry to the respective villages of these slain militants. The clashes were reported and according to locals a group of youth returning from funeral prayers of the slain local militant in Chillipora village of Shopian district pelted stones at the army camp in the area. To chase away the stone pelters, army, locals said fired a couple of rounds in the air. However, no injuries have been reported. Buried on a single day, all the six militants were killed in two different encounters in Zinpanchal forests in Charar-e-Sharief area of Budgam district and Heff-Shirmal village of Shopian on January 21 and 22. Among the six slain militants, three were from Shopian and three from Pulwama district. The slain militants included Sabzar Ahmed of Lassipora, Syed Raban of Nazneenpora Shopian and Touseef Ahmed of Nowpora Payeen Pulwama, Dr Shams-ul-Haq Mengnoo of Dragad, Aamir Ahmed Bhat of Chidipora, Shoaib Ahmed Shah of Shirmal Shopian. In the ongoing month, reportedly, 16 militants have been killed. Besides these six militants, those who lost their lives in different encounters include Shakoor Ahmed Parrey of Laribal Tral, Touseef Ahmed Thokar and Zubair Ahmed Bhat both residents of Chursoo Awantipora, Zeenat-ul-Islam of Sugan and Shakeel Ahmed Dar of Chilipora Shopian. Besides, a non-local militant was also killed in Chowdary Bagh Pulwama. On Wednesday, January 23, another encounter started in which three militants were killed in north Kashmir’s Baramulla district. As per the police spokesman, “as the searches were going on, the search party was fired upon by the militants. The fire was retaliated leading to a gunfight and “in the ensuing encounter, three militants were killed and the bodies were retrieved from the site of encounter. Their identities and affiliations are being ascertained,” he said.